Toru Takamizawa had his dark moments. The fact is that the little people of Lilliput saw Gulliver as a giant but Toru had the reverse, he was always conscious of his diminutive size here in the West. In fact he was a giant in the Art of Karate, he was the most intelligent, technical, fluid, precise and powerful Japanese Martial Artist that I had ever seen. “We are the same size, he would tell me, In England you are average size and in Japan I’m average size – so we are both the same – average!” I remember him taking a group photo of Instructors on a hill and arranging everyone in height order on the slope with him at the highest end so that we all appeared to be the same height. He would sleep in the day and be awake all night, studying physics, science and the human brain, his OCD meant that everything had to be ‘just right’ and he would be obsessive from lining people up straight to exactly how each technique should be performed. He was obsessive about hygiene and was terrified of my ‘dirty’ German Shepherd dog, he even thought kissing was dirty and one of the funniest moments (and believe me there were many) was when after a few drinks in Norway, a big strong Norwegian girl lifted him off his feet, pinned him on a table and stuck her tongue in his mouth! He stayed at my house many times, sometimes for prolonged periods before he moved down to Chatham permanently, many nights we had a bottle of Vodka, one of Martini and one of lemonade and discussed the universe at length until he started singing, when drunk he loved to sing in many different languages and my rule was that when he inevitably reached the Japanese National Anthem I would go to bed! He was a very funny person, sometimes intentionally and sometimes unintentionally, so many times I was left with tears running down my face and my stomach aching from laughter, maybe in another issue I’ll tell some of the funniest stories. But he died too young. At age 57 in 1998 he passed away and as the Japanese say ‘became a person in heaven’ from throat cancer. His legacy in the UK is huge. He broke away from the other Japanese Wado Ryu Sensei to found and run the highly successful Temple Karate Centre in Birmingham and headed one the first ground breaking large multi style Karate groups in the UK called “Tera Karate Kai”. Many of our top Karate Sensei and organisations today, including myself, emanate from those roots and owe much of their training and success to him. We went on to form the Takamizawa Institute of Karate (of which I was the first Chairman) to teach his unique concepts of movement in the Martial Arts, and relocated himself locally to me in the Medway area of Kent. When the other splits of the Japanese Sensei came about in Wado he realigned himself to his original Sensei Jiro Ohtsuka and was happily able to get back to his roots before he died. Toru was the youngest of seven children born to a Samurai family in Nagano Prefecture Japan, who he claimed were disgusted at him taking up the “foreign” Okinawan art of Karate at university which he told me was regarded as a “blue collar activity” and practised by the Yakuza. He graduated from university with a degree in Russian and came straight over to the UK to assist Tatsuo Suzuki to teach Wado Ryu Karate. In 1985 we published “Concepts of Karate” through TAKRO (Takamizawa and Rowe) in two parts “The structure of Tsuki and Keri” and “The structure of Uke and Dachi”. We produced them on an old Amstrad computer and printed them on an old Gestetner printing machine in a friend’s garage, but these books were Martial Arts goldmines and I’m sure that those who purchased them in the ‘80’s treasure them now. I would love to get them republished for their Martial Arts value, but wouldn’t dream of it without his family’s consent. Although my Karate bears little resemblance to what was his personal style nowadays, if you look under the surface, I still follow and teach his formula of movement unchanged, from all those years ago. “When Karate-do was first introduced to Britain, a lot of its essence was lost in the translation. The Japanese culture was so different from the British, there was no adequate translation for so many Japanese words, they found it difficult to understand our heritage and us theirs. The practice of Karate-do could be described as the struggle to see our own true nature, by identifying our weak points, we can learn to overcome them and become stronger. It is helpful for a teacher to be able to understand the composite parts of the student’s character, his national heritage, his family upbringing, his schooling and his own individual personality traits to enable him to get the best response. 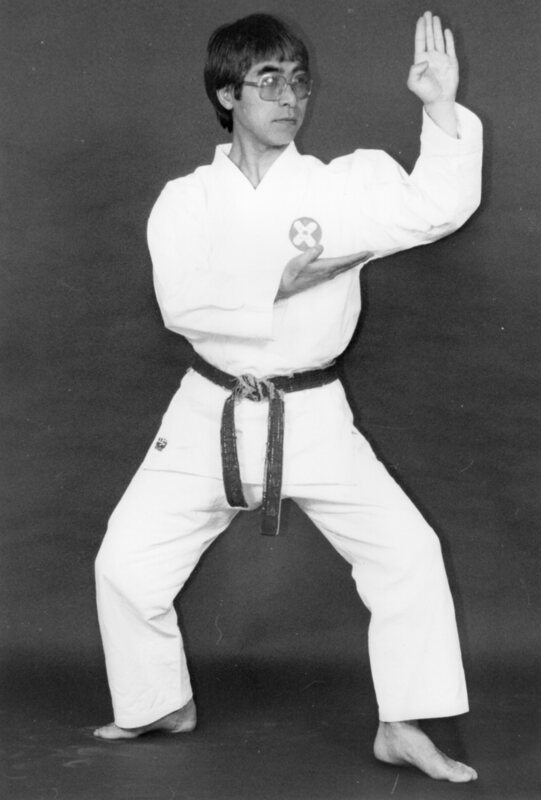 Toru Takamizawa brought the “way” of Karate over from Japan to England in 1966, he subsequently married an English girl and made many friends over here. He settled in the Midlands area opening the famous “Temple Karate Centre” that has produced so many of our champions and quality instructors around Britain today. Toru is an accomplished linguist and has therefore produced the most capable translations to date, his informal attitude and knowledge of the British mind has helped him become one of our foremost Instructors. He is unique in being able to utilise his genius in his approach to movement and technique in an entirely fresh and effective manner. His insight into the practical use of physics, his methods of using the mind to control movement and emotions puts him above any other instructor I have ever known. And they did. He used the books as a reference to all of his teaching for many years and 30 years later, I still refer to them when researching technique and translation. He was often accused of teaching “Karate by numbers” but had, in fact not only managed to codify the necessary factors to producing a good Martial Arts technique, but had managed to do it in a way that programmed the students brain to perform it successfully. In other words he hadn’t just codified it academically but also practically from a coaching point of view. Two major factors on Toru’s Karate were speed and safety and much of his teaching was oriented towards these ends. His own remarkable speed had to be timed to be appreciated, it seemed that he hit you powerfully with apparent ease – he didn’t look fast because he moved naturally. He would stress the difference between natural movement and moving naturally. Karate was not natural movements but practiced, skillful techniques done in a natural manner – a big difference! He would not allow us to use the term “relax” because of its connotations with laziness, but would insist on the term “without tension” to be more correct. He would also not allow us to use the term “kick” for “keri”. As he would say “kick” is what an Englishman does to a football or a tin can in the road and is a swing of the leg pivoting from the hip, whereas “keri” is any motion of the legs and therefore includes “kick” but is not limited to it. Instead of aggression or anger he would talk about inbuilt spirit or energy “Toh Shi” or “Toh Kon” (as in Shi Kon, although it was Okimitsu Fuji my Iaido Sensei who later named our association “Shi Kon” from the Budo concepts). All of his techniques were designed for joint safety and to prevent repetitive strain injuries from long-term training. The calm attitude and tension free movements allowed for greater control in pairs work. When I was reading books on Zen, Buddhism and Taoism he would chide me and encourage me to read science, physics and how the brain functions whilst he was staying awake all hours watching Open University and applying the science taught to his concepts of movement. All of his ideas sequenced the programming of the brain, if we made a mistake by stepping too long or wide, we had to correct it by moving the foot that we had moved to the wrong position to correct the correct (notice I said “correct” and not “right” another of his linguistic corrections) side and part of the brain! But Toru loved language and it’s use and this really helped him to find ways of coaching his ingenious training methods and he was a character that will be sadly missed by many in the Martial Arts world. But like many great Martial Artists, they live on through their teachings and I feel it’s good that when you are taught by a certain method it’s good to know where it came from. It is almost impossible to put these principles and the many others he introduced into print as you had to see his dynamic demonstrations to understand. But I had to try to give credit to the source of so much inspiration and instruction that takes place in English Karate today. I think that everyone is always in the right place at the right time, Takamizawa was gifted and cursed with being one of the first of the ‘new breed’ of thinking, inspired individuals who seem to litter the Martial Arts nowadays. His other gift and curse was that he was a Japanese whose mind was capable of improving traditional methods in a way that we westerners could understand. May he rest in peace safe in the knowledge that he inspired so many people in the Martial Arts including myself to study much deeper than we otherwise would have. Many will miss his personable character, enthusiasm for study and remarkable sense of humour. I certainly still do. Excellent article Steve I have only just come across it…are there any videos of Toru? Hi Barry – unfortunately he hated being filmed and there’s no real footage available. Fantastic to find this. I studied for five years as a kid at Temple in the late 70s/early 80s (do you know anything of Bob big West Indian fella who was there the same time as Eugene as well?) Toro planted some seeds in mind that have continued to sprout over the years. Great to read about him now and appreciate how wide his influence was. Wayne was my student and trained with Toru as a part of my club. As a 17 year old student at one of Toru’s clubs in Dudley, I recall my first of many lessons before one of his understudies would take over with the basic training. His teaching was inspirational in that he could bring the best out of your physical abilities like no other could. Softly spoken but powerfully put across. Great weekend courses in Tenby in 1979.